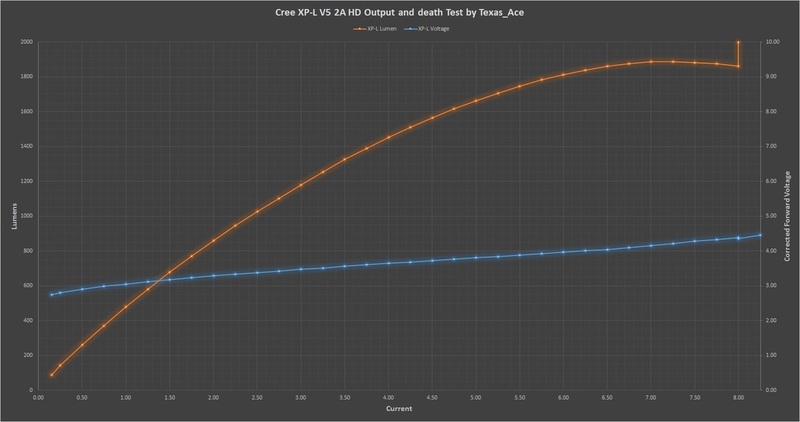 XP-L V5 Output & Death test by Texas_Ace Surprisingly close to the XP-L2 at low currents but not nearly as rugged. 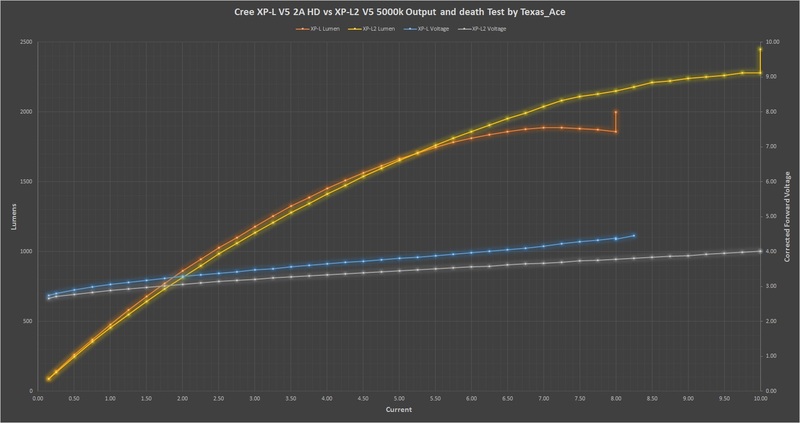 Thanks to CRX I was able to get an XP-L V5 as a comparison. Same setup as my other tests. The XP-L Actually made a bit more lumens per amp in the lower current ranges but this is not the whole story. Keep in mind that the Vf is much lower on the XP-L2 and due to this it is pulling less wattage at a given current. This is the reason for the discrepancy. If you compare them by wattage instead (which is what actually matters) then the XP-L2 is slightly ahead for the entire range and pulls way ahead at the end. The largest benefit of the XP-L2 though in flashlights is the much lower Vf. Instead of being limited to around ~6A like the XP-L we can get upwards of 9A+ and the much higher output to go with it. It is also a lot tougher as it was still living at 15A where the XP-L died at a bit over 8A with a blown bond wire. Overall they are both very nice, the XP-L2 is a marginal improvement technically but it is a big improvement in the real world FET flashlight use. Thanks for the test, that is a clear difference! I should have something to post about before too long. Got a few others before I get to that though. I don’t expect any difference from this test except for the lower output from the V2 bin. Your LED tests are excellent resources.